The introit is "Be Still and Know" by J. Jerome Williams. He attended Mars Hill College in Mars Hill, NC, and Appalachian State University in Boone, NC. 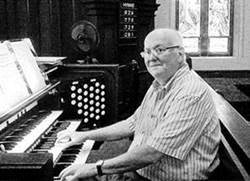 J. Jerome Williams taught high school band and was the choir director of the First United Methodist Church in Hickory, North Carolina, for 31 years, retiring in 2007. The opening hymn is the one we sang for Memorial Day weekend, "America, the Beautiful," hymn no. 564. 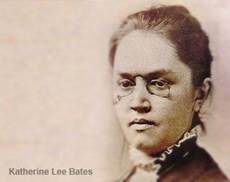 The text is by Katharine Lee Bates, the daughter of a Congregational Church pastor. It would be difficult to find a topic in American history that has been as completely shunned as the subject of female partnerships: the intimate and loving relationships between two women. Scholars writing about one or both members of a female couple invariably skirt the entire issue of the women's personal lives, or diminish the importance and implications of the relationship with such euphemistic statements as "the two were inseparable," or "this was the beginning of a close and devoted companionship." Such statements, often sounding as if the writers racked their brains to "protect" the subject's reputation from the taint of lesbianism, only serve to cloud the historically accurate record of real women's lives. This is particularly true in the writing of the lives of single women, who have often been considered in the public imagination (or lack of it) as either nun-like saints or emotional and sexual nonentities. The choir anthem is "God Bless America" by Irving Berlin (Israel Isidore Baline). He wrote the main part of "God Bless America" in 1917/1918 when he was at Camp Upton. In November 1938, he added introductory lyrics to the piece for Kate Smith. According to Wikipedia, in updating the song in 1938, Berlin intended to make it more a "peace song." He changed some of the words: "to the right" became "through the night." When Kate Smith sang it on her Armistice Day broadcast, the introductory lyrics had the phrase "Let us be grateful that we're far from there." By the time the music was published in March 1939 it was looking as if we might not be "far from there" for very much longer, so in the published sheet music the phrase became, "Let us be grateful for a land so fair." Berlin created a charity to receive the royalties for the song: "The God Bless America Fund." The money goes to the Boy Scouts and Girl Scouts of New York City. In 1917, Berlin also wrote the pro-war song, "Let's All Be Americans Now." You can hear it here: https://youtu.be/4LFKotgmmY0 "Let's All Be Americans Now"
The Old Testament reading is Psalm 33. Shout for joy, you upright; praise comes well from the honest. Give thanks to Yahweh on the lyre, play for him on the ten-stringed lyre. Sing to him a new song, make sweet music for your cry of victory. The word of Yahweh is straightforward, all he does springs from his constancy. He loves uprightness and justice; the faithful love of Yahweh fills the earth. By the word of Yahweh the heavens were made, by the breath of his mouth all their array. He collects the waters of the sea like a dam, he stores away the abyss in his treasure-house. for, the moment he spoke, it was so, no sooner had he commanded, than there it stood! but Yahweh's own plan stands firm forever, his heart's counsel from age to age. How blessed the nation whose God is Yahweh, the people he has chosen as his heritage. he alone molds their hearts, he understands all they do. it is delusion to rely on a horse for safety, for all its power it cannot save. to rescue them from death and keep them alive in famine. for in him our heart rejoices, in his holy name we trust. Yahweh, let your faithful love rest on us, as our hope has rested in you. The epistle reading is I Peter 2:9-11, in which the readers are assured they are God's chosen.
. . . But you are a chosen race, a royal priesthood, a holy nation, a people of his own, so that you may proclaim the virtues of the one who called you out of darkness into his marvelous light. You once were not a people, but now you are God's people. You were shown no mercy, but now you have received mercy. 1 Peter 2:9 references Exodus 19:6, when God speaks to Moses at Sinai: "you will be to me a kingdom of priests and a holy nation." The second hymn, no. 332, is Jane Parker Huber's "Live into Hope," which is sung to the tune TRURO, an anonymous tune first published by Thomas Williams in 1789. We sing another hymn to this same tune, Brian Wren's "Christ Is Alive." Traditionally, the tune is a setting for "Lift Up Your Heads, Ye Mighty Gates" and for "Jesus Shall Reign." The sermon title is "A Christian Nation! . . .?" 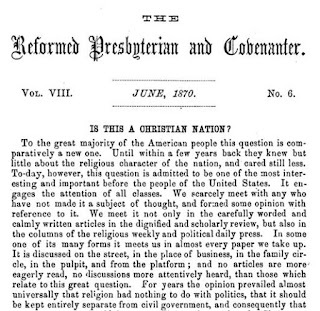 The lead article in June 1870 issue of The Reformed Presbyterian and Covenanter was "Is This a Christian Nation?" There was a movement in 1870 which had the aim of making the United States of America officially a Christian nation by amending the U.S. constitution. The article above concludes that the U. S. Constitution is the highest law of the land, and it is not a Christian document. In the constitution there is not the remotest reference to the Lord Jesus. A person ignorant of the fact might read it from first to last, and not know that Jesus ever lived. . . . It in no way discriminates in favor of Christianity. It extends to it no protection which it withholds from systems of error and unbelief. . . . The constitution of the United States makes no mention of Almighty God, the author of national existence; nor of the Bible, which is the fountain of law and good morals as well as religion. The author thinks this is a deficiency that should be corrected. Resolved, that it is the right and duty of the United States, a nation settled by Christians, a nation with Christian law and usages, and with Christianity as its greatest social force, to acknowledge itself in its written Constitution to be a Christian nation. One does not see how the mere declarations of Christian faith can affect the religious condition of the land. Either, as a nation, we are Christians or we are not Christians. If we are Christians, the Christian faith will make itself felt and show itself in our national policy. If we are not Christians, no declaration to the contrary can be of any avail. Luckily for us, the wiser heads prevailed. The hymn before communion is no. 517, "We Come As Guests Invited." It is sung to the tune WIE LIEBICH IST DER MAIEN. It is also used for "Sing to the Lord of Harvest." It is long though, so you may want to skip part of the first part. The closing hymn is "My Country 'Tis of Thee," no. 561. 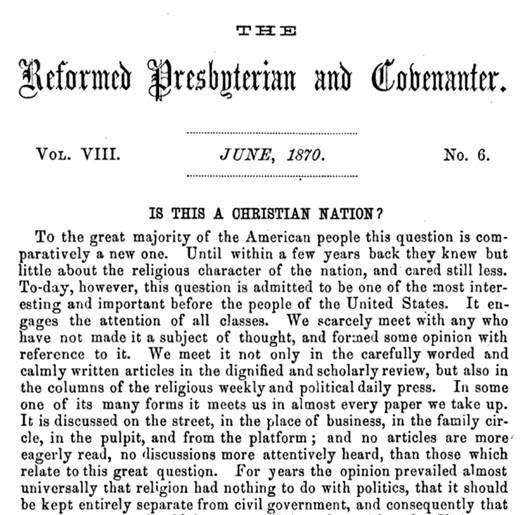 The words were authored by Samuel Francis Smith in 1832. The tune is now called AMERICA in the United States. The tune first appeared in Harmonia Anglicana, published in 1742, but NOT with that name. Harmonia Anglicana was retitled and appeared under the title Thesaurus Musicus, in 1744, and it was expanded to two volumes. "God save our Lord the King, long live our noble King"
and the name used for the tune was not AMERICA. The tune (with the original words) was first publicly performed and sung at the Drury Lane Theatre on 28 Sep 1745. The words, "God save our Lord the King, long live our noble King" are believed to pre-date the tune, as they appear etched on a drinking glass believed to date from 1725. 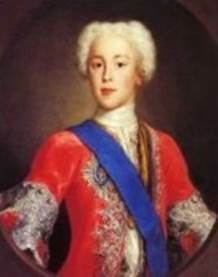 However, the words on the glass referred to Bonnie Prince Charlie (a Stuart, Charles Edward Stuart, the Young Pretender to the throne) and was used by a supporter of the Jacobite rebellion. https://youtu.be/041nXAAn714 William Blake's "Jerusalem" (music by Hubert Parry) followed by "God Save the Queen"
At all international sports competitions (bar one), "God Save the Queen" serves as the national anthem for England. The one exception is cricket. For cricket games, the song used as the national anthem for England is Hubert Parry's "Jerusalem." From every latent foe, / From the assassins blow, / God save the Queen! The tune became popular in the colonies by 1761, and different American verses were sung to the tune. Samuel Francis Smith did not author his words to the tune until about 1831, as on 04 Jul 1831, they appeared (five verses) on a broadside (without music) published by the Boston Sabbath School Union, Park Street Church, Boston. Later publications of the hymn, under the title My Country! 'Tis of Thee, included only four verses. 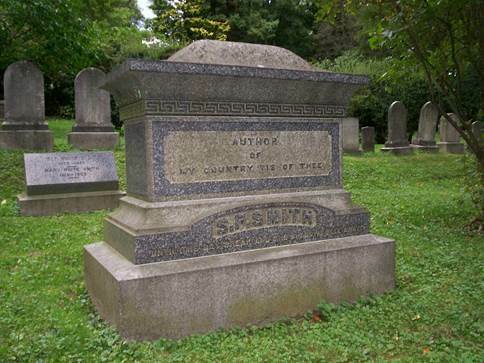 Samuel Francis Smith was born 21 Oct 1808. He was a classmate of Oliver Wendell Holmes at Harvard, which he attended from 1825 to 1829. He worked in Boston for a time as editor of the Baptist Missionary Magazine. 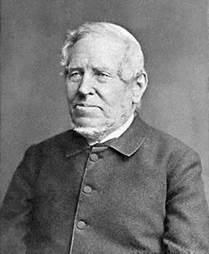 Smith attended Andover Theological Academy and on 12 Feb 1834 was ordained a Baptist minister in Waterville, Maine. While in Maine, he was professor of modern languages at Waterville College. He then moved to Newton, Massachusetts, where he was editor of various publications of the Baptist Missionary Union and pastor of the First Baptist Church in Newton Centre. 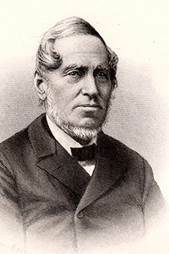 Smith wrote over 150 hymns and helped compile a Baptist hymnal in 1843. Smith was also a local historian, and in 1880 published History of Newton, Massachusetts. He died suddenly on 16 Nov 1895 while traveling by train to Readville, a Boston neighborhood, where he was to preach. He was buried in Newton Cemetery. S. F. Smith's large monument notes that he is the author of "My Country 'Tis of Thee." The prelude is Léon Boëllmann's "Prière à Notre-Dame (Prayer to Our Lady)" in A-flat major—the third movement of his Suite Gothique, Op. 25. It is sometimes described as "dreamy music." After graduation, he "moved in the best circles of the French musical world." It was said he could "coax pleasing sounds out of recalcitrant instruments." The offertory music is "Cross of Jesus (Meditation)" by Charles Callahan. It is an arrangement of the communion hymn of the same name. The original tune is by John Stainer (1887). In our hymnal, the tune is used "For the Bread which You Have Broken," no. 509. This tune is also used as a setting for "Come, Thou Long-Expected Jesus" although in the Presbyterian Hymnal, that hymn (by Charles Wesley) is set to STUTTGART (no. 1) and HYFRYDOL (no. 2). Sir John Stainer composed the tune to go with a hymn he authored in 1887, "Cross of Jesus, Cross of Sorrow." John Stainer was born in London, 06 Jun 1840. His father, who played piano, organ and flute, was the schoolmaster at St. Thomas's School, Southwark. By age seven, John Stainer could play Bach's "Fugue in E Major" on the organ. Stainer was the organist at St. Paul's Cathedral from 1872 to 1888. He received a knighthood from Queen Victoria in 1888 for his services to music. He died in Verona, Italy, on 31 Mar 1901. The postlude is "Voluntary on 'Hyfrydol'" by Charles Callahan. Perhaps the "Voluntary" is this "Finale" on HYFRYDOL. Rowland Huw Prichard was a native of Graienyn, Wales, born 14 Jan 1811. He was a loom tender's assistant in Holywell and died there 25 Jan 1887. His song book, "The Singer's Friend" was written for use by children. "Hyfrydol" means "cheerful," and was composed by Prichard when he was 20. Wikipedia describes the tune as "impressively flexible . . with beautiful chord progressions." It is also the tune for "Love Divine, All Loves Excelling." In fact, many different hymns are sung to the tune. In the Baptist Hymnal alone, in addition to the two hymns just named, there are: "Praise the Lord! Ye Heavens, Adore Him," "Jesus! What a Friend of Sinners," and "I will Sing the Wondrous Story."